Next tools can be used by users for documentation of problems on their computers. Sometime user’s problem description is not perfect, mostly you can forget about logs, but always you can ask for screenshot. 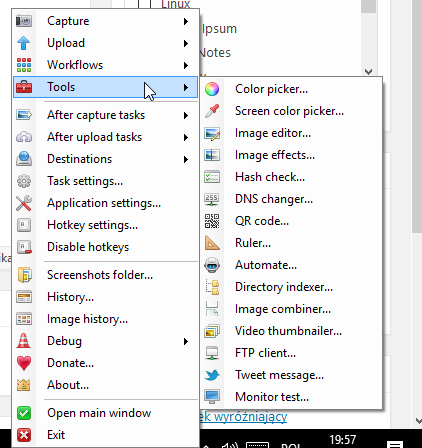 In windows 7 or 10 you can find app snipping tool but I think that we can use something more user friendly. Two tools ShareX and Greenshot. Both free with GPL licence suitable for commercial use, and with similar gui. Please remember to pay small contribution for devs for their work. As you can see on screenshot, it is quite extended and full of features tool . For me most important is , when I press PrintSCR on my keyboard i can chose with scoped region for capturing. 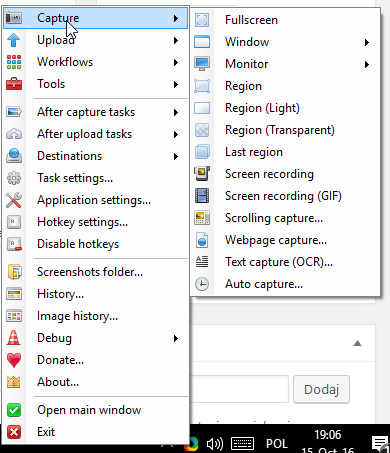 (In Greenshot is as default action , but for ShareX it must be reconfigured in Hotkey Settings section. ShareX can capture screen to PNG, JPG and animated GIF which is great to demonstrate „how to” to the users ! But most important is Screen recording. It requires to download ffmped codec. But is easy and I love it! Mostly I use it when I have to create manuals, tutorials and documentation. Is only for screenshots , but is easy and fast. 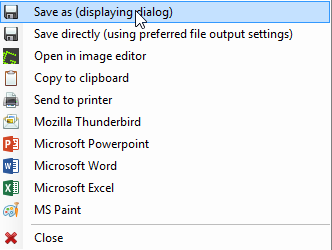 On default installation Printscreen captures selected region of the screen . Rest is almost the same like in ShareX , but animated GIFs and Video recording. Greenshot is easier for typical jobs like capture screen to static file, it is 1.5 Mb large installation file only . Installation file can be configured, and uploaders can be disabled when install if your company’s policy does not allow on it. Sorry, this area is restricted.